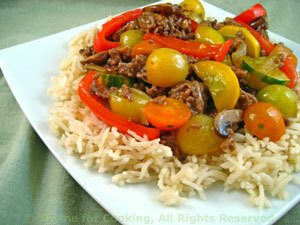 Stir-Fried Beef with Zucchini and Cherry Tomatoes, Thyme for Cooking. Cut zucchini in half the long way, then each half in thin slices. In large nonstick skillet heat oils over medium-high heat. Add onion, pepper and stir-fry 5 minutes. Add garlic, ginger, zucchini and stir-fry 5 minutes longer. Remove to a plate. When beef is browned, return vegetables to skillet and add stock, sherry and soy sauce. Spoon over Basmati Rice and serve.